California Wedding Planner Insurance. As a wedding planner, your job to ensure that everything for the wedding is in place so that the bride and groom can focus on their big day. This day should be a beautiful one for your clients, which is why you should try to anticipate anything that could go wrong. Although you can try to ensure that everything is in place, you may still miss some things. Things such as inclement weather, vendors not sticking to their responsibilities, injuries and a host of other things. Many of these things you've probably experienced at one time or another which is why it's important to protect yourself by having insurance. In this post, we'll discuss the different California wedding planner insurance plans you can get to protect your business. California wedding planner insurance protects your business from lawsuits with rates as low as $27/mo. Get a fast quote and your certificate of insurance now. Insurance is important to your business. It helps you to protect your business from anything that can go wrong beyond your control. There are many different policies you can get for your business as a wedding planner. Let's take a look at some of the specific types of California wedding planner insurance you can use to protect your wedding planning operation. General liability insurance protects you from third-party bodily harm and property damage claims made against your business. If there's a lawsuit against you, then this insurance helps to cover any costs associated such as legal fees or court costs. 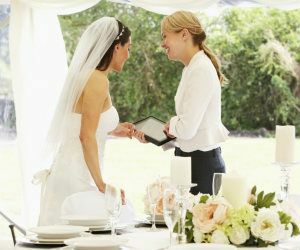 This California wedding planner insurance also covers settlements or judgments and medical expenses. Professional Liability Insurance: To adequately protect your wedding planning business a wedding planner must have professional liability insurance - also know as errors and omissions (E&O). This insurance coverage protects you when a client suggests that the services you provided were not up to standard, negligent or caused them harm. This insurance covers any mistakes made in your business. When a client isn't satisfied with the services you offered, you must have California wedding planner insurance to protect you if they sue you. Workers Compensation: When people work for you, it is mandated in most states that have workers comp for any non-owner employees. CA Workers comp coverage is the insurance that helps you to protect your employees. If an employee is injured while working for you, this California wedding planner insurance helps to cover any expenses associated with the injury. Also if an employee dies as a result of their sustained injuries this insurance will pay benefits to the surviving family. CA Commercial Auto Insurance: As a wedding planner, you are sometimes going to use vehicles to transport equipment for your business. This makes having insurance to protect your business vehicles important. You can never predict what can happen on the road but having this insurance protects you when something does. If a vehicle you use for your business causes property damage or third-party bodily harm commercial auto insurance will keep you covered. Request a free California Wedding Planner insurance quote in Alameda, Alhambra, Anaheim, Antioch, Apple Valley, Bakersfield, Baldwin Park, Bellflower, Berkeley, Buena Park, Burbank, Camarillo, Carlsbad, Carson, Chico, Chino Hills, Chino, Chula Vista, Citrus Heights, Clovis, Compton, Concord, Corona, Costa Mesa, Daly City, Davis, Downey, El Cajon, El Monte, Elk Grove, Escondido, Fairfield, Folsom, Fontana, Fremont, Fresno, Fullerton, Garden Grove, Glendale, Hawthorne, Hayward, Hemet, Hesperia, Huntington Beach, Indio, Inglewood, Irvine, Lake Forest, Lakewood, Lancaster, Livermore, Long Beach, Los Angeles, Lynwood, Manteca, Menifee, Merced, Milpitas, Mission Viejo, Modesto, Moreno Valley, Mountain View, Murrieta, Napa, Newport Beach, Norwalk, Oakland, Oceanside, Ontario, Orange, Oxnard, Palmdale, Palo Alto, Pasadena, Perris, Pleasanton, Pomona, Rancho Cordova, Rancho Cucamonga, Redding, Redlands, Redondo Beach, Redwood City, Rialto, Richmond, Riverside, Roseville, Sacramento, Salinas, San Bernardino, San Buenaventura, San Diego, San Francisco, San Jose, San Leandro, San Marcos, San Mateo, San Ramon, Santa Ana, Santa Barbara, Santa Clara, Santa Clarita, Santa Maria, Santa Monica, Santa Rosa, Simi Valley, South Gate, Stockton, Sunnyvale, Temecula, Thousand Oaks, Torrance, Tracy, Turlock, Tustin, Union City, Upland, Vacaville, Vallejo, Victorville, Visalia, Vista, Walnut Creek, West Covina, Westminster, Whittier, Yorba Linda, Yuba City and all other cities in CA - The Golden State.